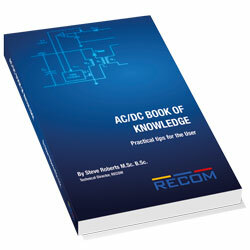 Steve Roberts publishes his brand new AC/DC Book of Knowledge in time for electronica 2018. The technical director at RECOM is sharing his extensive electronics knowledge with students and engineers from around the world and handing out copies at the Show. Although the company is known for the manufacture of DC-DC converters, their portfolio also covers a wide range of AC/DC products from 1W up to 960W. While knowledge acquired in the development of these products is occasionally similar to that of DC-DC products, it can often be very different. The new standalone book is released as a companion volume to the DC-DC Book of Knowledge.